Your jawbone (the mandible) meets your skull bone (the temporal bone) at the temporomandibular joint or TMJ. On a good day, this joint allows your mouth to open and close, to speak and eat or rest. On a bad day, you can develop pain and dysfunction in the TMJ that affects many areas of your life and health. Dr. Sevey and Dr. Sigwart explain more below about how problems with your TMJ are connected to problems with sleep. If you have a recurring problem with your temporomandibular joint, it’s called temporomandibular disorder (or TMD, although TMD and TMJ are often used interchangeably). The National Institutes of Health estimates that 10 million people have TMD, though the cases are usually mild. TMD frequently includes pain, clicking or popping, and tight, sore facial muscles. TMD can be caused by genetics, arthritis, or jaw injuries.Sometimes it’s hard to diagnose what’s exactly causing the problem because stress and jaw problems can turn into a painful, self-perpetuating cycle. Clenching and grinding your teeth may be chronic or stress-induced habits that make TMJ pain worse.You may also notice that pain from TMD can spread into your face, neck, head, and shoulders. Many TMD sufferers suffer from chronic headaches and migraines. One study found that 43% of people with TMD also have problems sleeping. So what’s the link between TMD and sleep apnea? When the airway collapses as it does with obstructive sleep apnea (OSA), the body’s automatic response is to push the lower jaw forward to open up the airway. This constant motion of the TMJ throughout the night can cause a lot of stress and tension in the jaw joint and is the primary reason TMD and sleep apnea go hand-in-hand. TMD is also known to be linked with chronic fatigue syndrome which can exacerbate sleep apnea and impact your overall health.It could also be the physical position or misalignment of your jaw (malocclusion) that prevents the airway from staying open while you sleep. 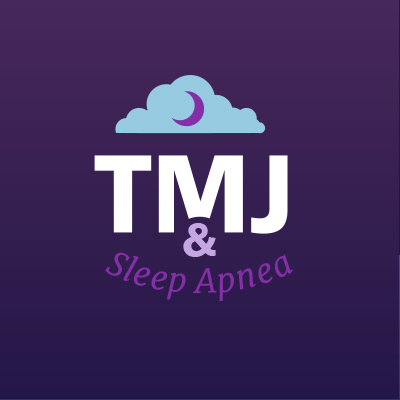 When you think about how connected your airway is to the position of your jaw, the connection between sleep apnea and TMD becomes very clear. Sometimes TMD goes away on its own, but you don’t have to live with the pain and difficulty of TMD. Your Bangor dentist can be a partner in your overall health and wellness. Especially because good sleep is so important for every other part of your health, it’s a good idea to take care of yourself and get better rest at night. Sleep apnea will not go away on its own and can lead to serious health complications if left untreated. Sleep apnea increases your risk of heart attack, stroke, diabetes, and many other serious diseases, and can even be deadly. If you have any sleep issues or any kind of pain in your jaw, you should see your Bangor dentist immediately to begin looking for answers. Life is no fun if you’re sick, tired and in pain! Make an appointment today at Creative Dental Solutions in Bangor to take the first step toward a healthier you and a better quality of life. ‹ Rising Oral Cancer Rates – Have You Been Screened?